The original and still the best solution for confined space, high angle or technical rescue, and traditional land based applications, the Sked stretcher is a revolutionary design which provides outstanding patient protection and security. 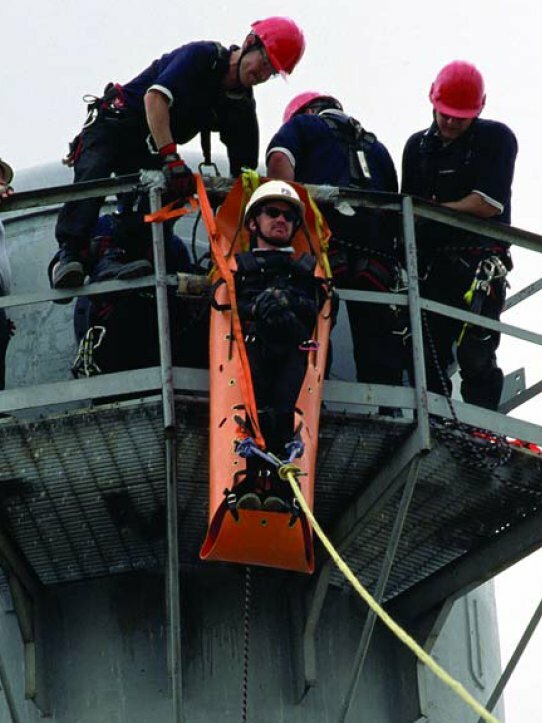 The Sked comes equipped for raising or lowering in horizontal or vertical configurations in technical rope rescue, collapse incidents, caves, confined spaces or helicopter operations. When the patient is packaged, the stretcher becomes rigid. The durable plastic provides protection for the patient while allowing extrication through the most demanding confined spaces. The stretcher is rolled for storage in a tough cordura backpack which is included with the system. The system ships at 19 lbs. and comes complete for most applications. Available in International Orange or O.D. Green for military, S.W.A.T. and other tactical situations. Skedco will make the Sked in sand color or white for desert or snow operations on special order. SK-202 Cordura backpack/Towing Harness - this durable backpack includes shoulder straps and pockets for storing the Sked accessories when not in use. SK-203 Horizontal Lift Slings - a pair of 9,000 lb. tensile strength slings is provided for hoisting the Sked stretcher by helicopter or other haul system in a horizontal position. SK-204 Tow Strap - this 6 foot strap with bronze snap hooks on each end attaches the Sked stretcher to the backpack, changing the backpack to a useful towing harness. It can be used by one or more people, in several configurations for towing the Sked. It is not to be used for hoisting patients. SK-205 Removable Webbing Handles - in addition to the four handles sewn permanently onto the Sked stretcher, four additional removable handles are provided to allow the Sked to be carried by up to 8 rescuers. SK-206 Steel Locking 'D' Carabiner - a large locking 'D' steel carabiner is included with the system for attaching the stretcher to a hoisting system. These carabiners are rated at a 9,000 lb. minimum break strength. SK-207 Vertical Lift Rope - for lifting in the vertical position, 30 ft. of 3/8" PMI kernmantle rescue rope, with a minimum break strength of 5,265 lbs., is provided.